Sticky microfiber cleaning cloth has silicone adhesive back. Reusable, easily peels off & on to stick to phones, tablets, etc. Front is made of woven microfiber cloth to safely clean sensitive surfaces such as smartphones, screens, glasses camera lenses and more. Displays full color art on front side. Wash sticky adhesive back with water to remove dirt residue and make sticky again. No less than minimums or special column pricing. Customize front of card free of charge; Add $.10(V) per unit to customize back of card. Custom artwork must be provided to size, no exceptions. 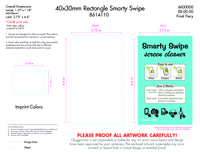 Please note: Exact color matching on both the swipe and printed marketing card are not possible due to different substrate materials in each item (card &swipe). string(24) "Custom per your artwork "
string(76) "40 X 30mm (Swipe), 4 5/8" x 2 3/4" (Pouch), 4 5/8" x 2 3/4" (Marketing Card)"
string(73) "Customize front of card free of charge. Back of card custom: Add $0.10V. " Customize front of card free of charge. Back of card custom: Add $0.10V.